LEDsInside reports that Samsung and China's largest LED producer San'an Optroelectronics signed a long-term agreement to co-develop Micro-LED displays. Under the agreement, Samsung pre-paid San'an $16.83 million to secure micro-LED chips. San'an says that following its Micro-LED development completion, it aims to become Samsung's major chip supplier. It is estimated that it will take San'an three years to achieve mico-LED mass production, but apparently it will supply Samsung with such chips throughout the next three years (maybe using a lower-volume production method). 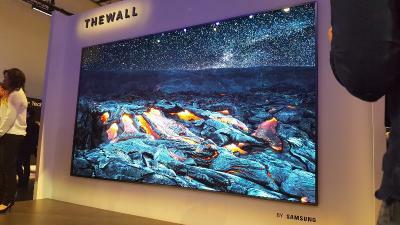 Last month Samsung announced its first Micro-LED TV, the 146" modular "The Wall". Samsung is said to be looking at several alternatives for its micro-LED TV project, one of which is to acquire Taiwan-based PlayNitride - a deal that was already reported in April 2017 but is reportedly progressing. It's not clear what this new agreement with San'an means regarding the PlayNitride acquisition.